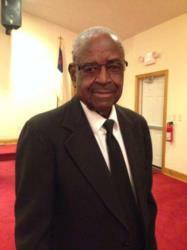 Obituary for Elquient Gary, Sr.
With humbled hearts and consoling minds, S. Jones F. and C. serves notice that Mr. Elquient Gary Sr., 88, of Enfield, NC has layed down the cares of this world in the nursing facility of Enfield Oaks. From there, Trustee Gary picked up his new wardrobe and golden keys for his everlasting life in Heaven. The family has reserved Saturday, October 13, 2018 beginning at 6:00 in the evening, for family and friends to come and pay their respects during the public viewing that will take place in the Reposing Room of S. Jones Funerals and Cremations. A Home Going Celebration will be held 3 pm, Sunday, October 14, 2018, in the sanctuary of the Daniels Chapel Baptist Church, 5413 Justice Branch Rd, Enfield, NC 27823 where he served on the board of Trustees. His mortal frame will be transported to the Pleasant Hill Church Cemetery for Internment with Military Honors. Tilneil, prayers for comfort and the loving happy memories of your grandfather to celebrate his life and the love he had for you! Prayers for your grandmother and all of your family and friends!